Product code: B22 Categories: Animal & Bird, Cotton, Creams & Whites, Fryetts Fabric, Greys & Blacks, Luxury Fabric. Bees in Linen by Fryetts Fabric is on trend in design and colour. 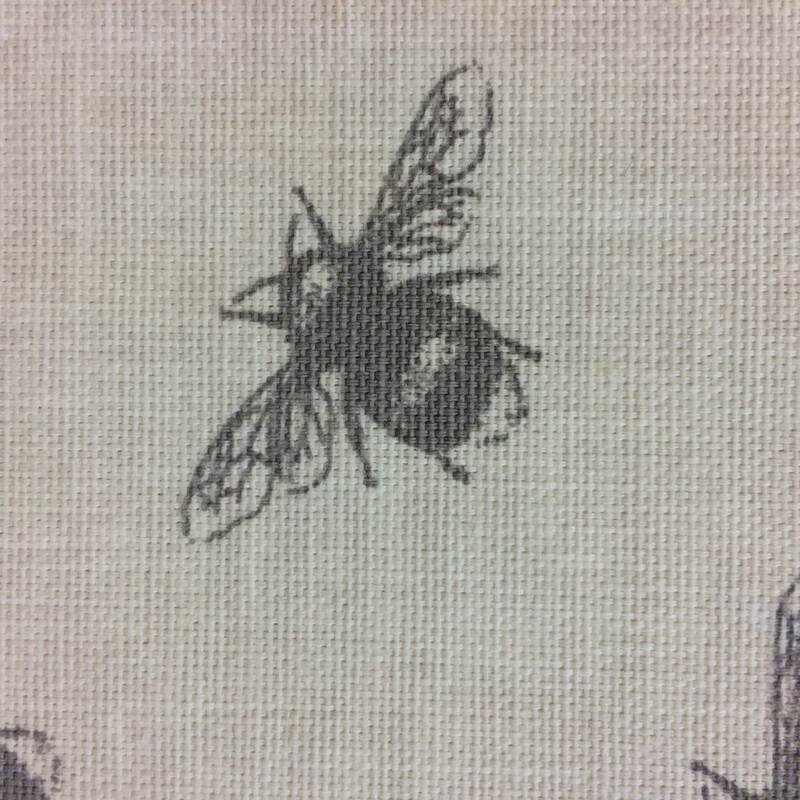 A linen coloured fabric with rows of grey bees buzzing over the fabric. The combination of creams and grey is very much on trend at the moment. The fabric is 100% cotton, which makes it strong and breathable. Therefore, the fabric can be used for a variety of soft furnishing projects. This includes curtains, blinds and even light domestic upholstery. 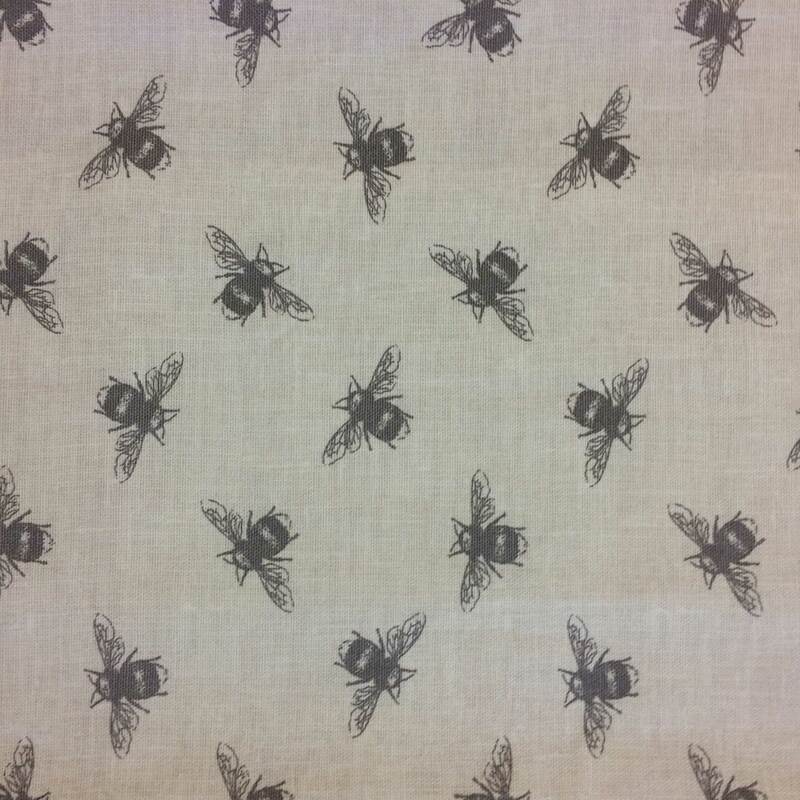 Bees in Linen has to be one of the most versatile fabrics we have in the shop. It can be used in a baby’s nursery, through to a kitchen, bedroom or hall. The fabric composition means that you can use it for nearly every soft furnishing project that comes to mind. Beyond curtains, blinds, cushions and upholstery, why not go for a more adventurous project like a bean bag or a simple tablecloth? 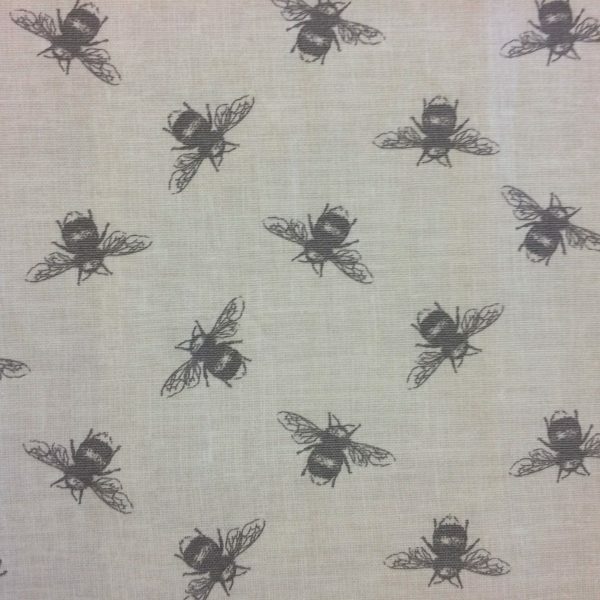 The bee pattern coverage across the fabric is perfect for cushions, blinds and upholstery. While, the fabric composition means that the fabric is strong and drapes well for drapes and valences. The fabric measures 1.4metres in width, excluding selvedge. While the pattern repeat measures at 16centimetres. This Fryett’s Fabric can be washed at 30°C and ironed with a cool iron. We stock fabrics on the roll. Our team process orders with fabric cut as a single continuous piece. Digby & Willoughby are pleased to offer our customers a free sample of this fabric. We recommend customers request a free sample to check the colours and fabric quality before placing an order. Customers can request a free sample by clicking the ‘Free Sample’ box at the top of the page, then ‘Add to Basket’. 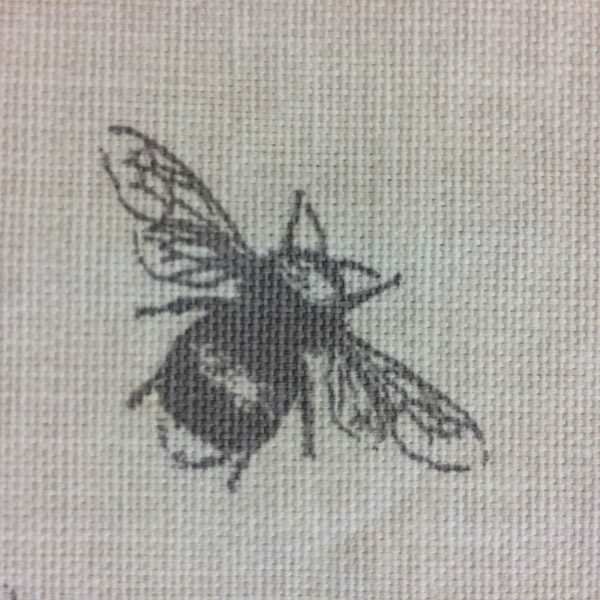 While we stock Bees in linen on the roll, we are able to order in colourways Purple and Duck-egg in 100% cotton. We are also able to order in colourways Linen and Duck-egg in 100% cotton with PVC Coating, which is ideal for use in the kitchen. Customers can contact us to discuss ordering this fabric in other colourways and compositions.